Citadel: Forged With Fire is getting new daily quests for all players, and they'll reward you with crafting materials and boosts. If you’re a fan of Citadel: Forged With Fire and you want to keep the steady flow of content the game’s been getting going, then it’s your lucky day. Today, developer Blue Isle Studios announced the addition of daily quests to the game, something that fans have been asking for a long time, but it’s not as simple as going to the main menu and activating them. First off, three brand new quest givers will be added to each starting town in the game. Each one of these quest givers will entrust players with new, changing quests and objectives each and every day. Blue Isle Studios did not disclose what these quests would entail, however, it was confirmed that completing said quests will reward players will new crafting materials and boosts. In addition to that, special daily quest givers will appear for Max Level players outside boss shrines. Once again, it’s unknown what these quests will task players with or what they will reward them with. Citadel: Forged With Fire is in early access right now on Steam. It’s unknown when the game will fully launch, however, it is expected to be available on PlayStation 4, Xbox One, and PC. 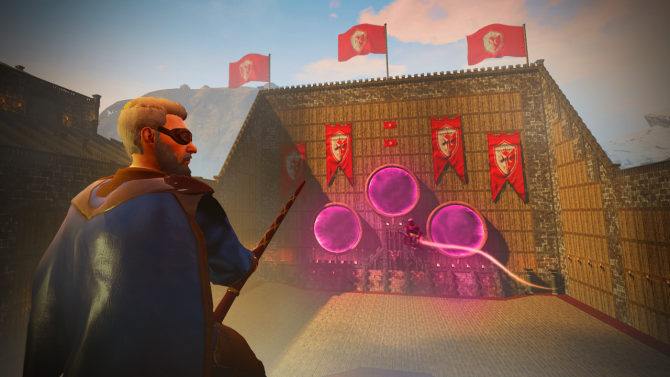 Blue Isle Studios' Citadel: Forged with Fire is getting a new Broomstick League mode that adds an in-game Quidditch mode.